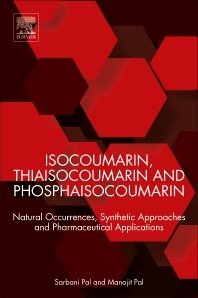 Isocoumarin, Thiaisocoumarin and Phosphaisocoumarin: Natural Occurrences, Synthetic Approaches and Pharmaceutical Applications gives an overview of the various aspects of this class of heterocycle, with a major focus on synthesis and biological activity. Aromatic δ lactones or isocoumarins with thiaisocoumarins, phosphaisocoumarins and a-pyranone fused with a heteroaryl ring constitute an important class of heterocyclic compounds. This book provides the methods applied for the synthesis of thiaisocoumarins, phosphaisocoumarins, and a-pyranone fused with a heteroaryl ring. It is useful to medicinal and natural product chemists who want to synthesize target molecules and develop cutting-edge technologies to provide better solutions to researchers. Sarbani Pal is working as a faculty and head in the Department of Chemistry of M.N.R. Post-Graduate College in Hyderabad, India. Born in Kolkata, India, Dr. Pal began her university training at the University of Calcutta, where she obtained her M.Sc degree in Chemistry with specialization in Organic Chemistry in 1990. She subsequently moved to the Indian Association for the Cultivation of Science, Kolkata, India, where she worked under the guidance of Professor D. Mukherjee with a research fellowship (1991–1996) awarded by Council of Scientific and Industrial Research, New Delhi, India. She was awarded her Ph.D. degree by Jadavpur University, Kolkata, India, in 1996. She then moved to the Department of Chemistry, M.S. University, Baroda, Gujarat, India, where she worked as a Lecturer in Chemistry (1996–1997). Subsequently, she moved to Hyderabad, India, where she joined the M.N.R. Post-Graduate College as a Lecturer in Organic Chemistry. Her research interests include the total synthesis of bicyclic and tricyclic sesquiterpenes, synthesis of organo–ruthenium complexes, design and synthesis of anti-inflammatory agents and macrolide antibiotics. She has supervised several PhD students and published more than 50 research papers and review articles in various international journals. She was awarded Bioorganic and Medicinal Chemistry Letters Top 10 Cited Author for 2011-2012. Manojit Pal received his M.Sc degree in Chemistry from the Indian Institute of Technology, Kharagpur, India in 1989 and PhD degree from Jadavpur University, Kolkata (India) in 1995. He then worked as a Research Officer-R&D in the Alembic Chemical Works Co Ltd. and as an Executive-Organic Synthesis in the Sun Pharma Advanced Research Centre. In 1998, he joined Dr. Reddy’s Laboratories Limited (DRL) in Hyderabad as a Senior Scientist and became Senior Director Discovery Chemistry in 2006. In 2007, he joined the New Drug Discovery Department of Matrix Laboratories Limited, Hyderabad as a Senior General Manager and played the role of administrative head of that department. In 2009, he joined the Dr. Reddy’s Institute of Life Science, Hyderabad and presently continuing as a Professor and Head of Organic and Medicinal Chemistry. He is a recipient of the CSIR Certificate of Merit 1989, Bioorganic & Medicinal Chemistry Letters Most Cited Paper 2003-2006 Award, Bioorganic and Medicinal Chemistry Letters Top 10 Cited Author certificate for 2011-2012 and others. He has been recognized as one of the most cited Organic Chemists in India (Current Science 2015, 109, 869). He became Associate Editor of RSC Advances in 2015 and FRSC in 2016. His research interests include the development of new chemical entities under the new drug discovery programme in various therapeutic areas. He has authored/co-authored more than 200 research publications, as well as 14 review articles and a number of patents.